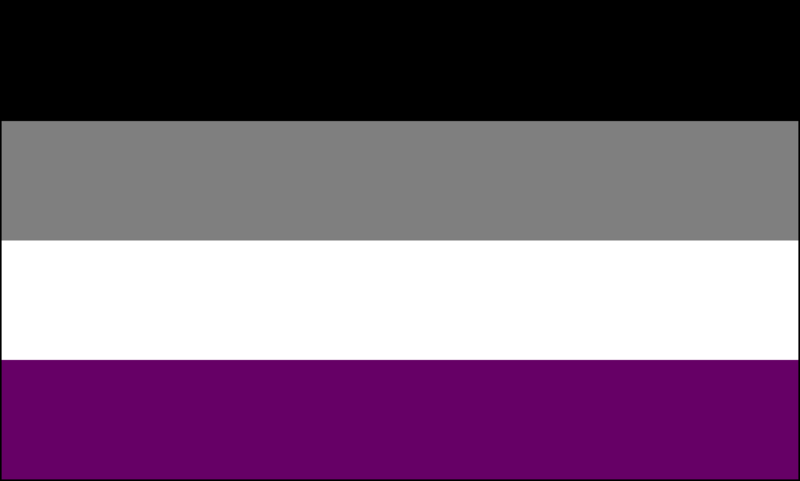 This entry was posted in Ace Images, Asexuality in the World and tagged ace flag, asexual, asexual visibility, asexuality, aven, gsm, vexillology, visibility by asexualityarchive. Bookmark the permalink. I just want to thank you for this blog, I’ve always felt alone and like I was a freak because of that fact I’m asexual and now I am nearly in tears because I feel like I’m now part of something. I now know I’m not alone and this blog has helped me by explaining a few things!! Thank you so much!! One thing you may have missed in your research is that the flag colors slightly predate the flag. That’s the reason why, when all the flag proposals were being made, they stuck more or less to the same color scheme. I’d find the relevant AVEN thread but AVEN is down at the moment. I like the flag. I discovered after reading a magazine article, and after my brother asking me if I was, that I am asexual. It explains a lot. I’ve always been different. And I just recently realized that there’s also something called aromantic. I’m not romantic at all either, which means I’m also aromantic. the prefix a means without, so I’m without what? Without sexuality and without romance. 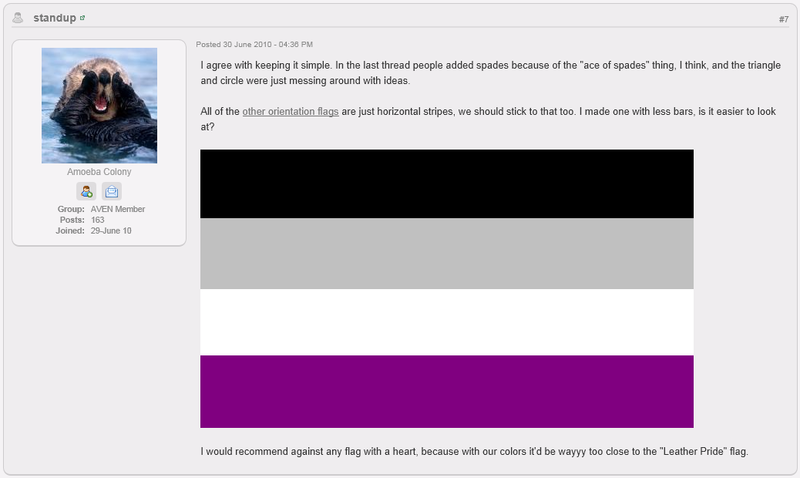 Anyway, I never knew there was an asexual flag. Where can I get one? I am the samw way, so its great to see others like me. I always thought I was just a normal Hetro, but I realised all the people I thought I was in love with, I didn’t feel sexual attraction to them, I only liked them because I mistook friendship as a love thing. I also suffer from erotophobia, I personally like not relying on people, because that’s just the person I am. omg I felt the same way I would have crushes on people but would never truly love them. 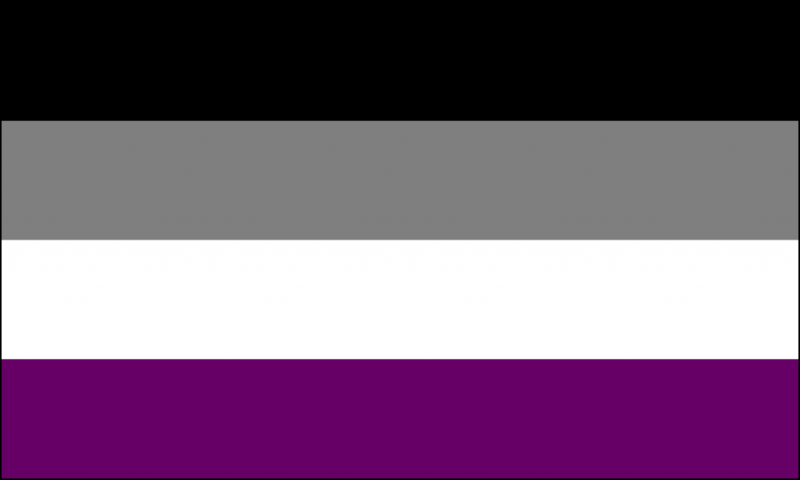 I’ve only just recognized that I’m asexual, and I’m so relieved to see this flag. I have a large support system of members of the LGBTQA* community who have helped me accept and love myself, even without feeling sexual needs for others. Thank you for your hard work on the flag and raising awareness in the community! Why black? Not a colour That I like to represent, neither black nor white , wish it was something else than black. It’s to show the lack of sexuality. Black is the lack of color, asexuality is the lack of sexual attraction. I feel the exact same way!!!! Especially science all of my friends LOVE that sort of stuff. So when I was in like 8 grade and high school people would just be like oh there sooooo hot and I’d be there just so confused!! Sounds like you might be demi or grey ace. Demisexuality falls under the umbrella of asexuality; it’s when you don’t feel sexual attraction unless there’s a strong emotional bond. Interest in romance is considered a separate thing so you could even be biromantic ace/demi. With or without a label though don’t feel like you have to do anything you’re uncomfortable with; your boundaries should be respected.